Discovered at the end of the 19th century and partially excavated by the American School of Classical Studies at Athens, the gymnasium was the center of social and intellectual life in the Hellenistic city. Trial soundings by the Swiss School in 1993-1995 led to the publication of the monument by Elena Mango in 2003 (Eretria XIII). 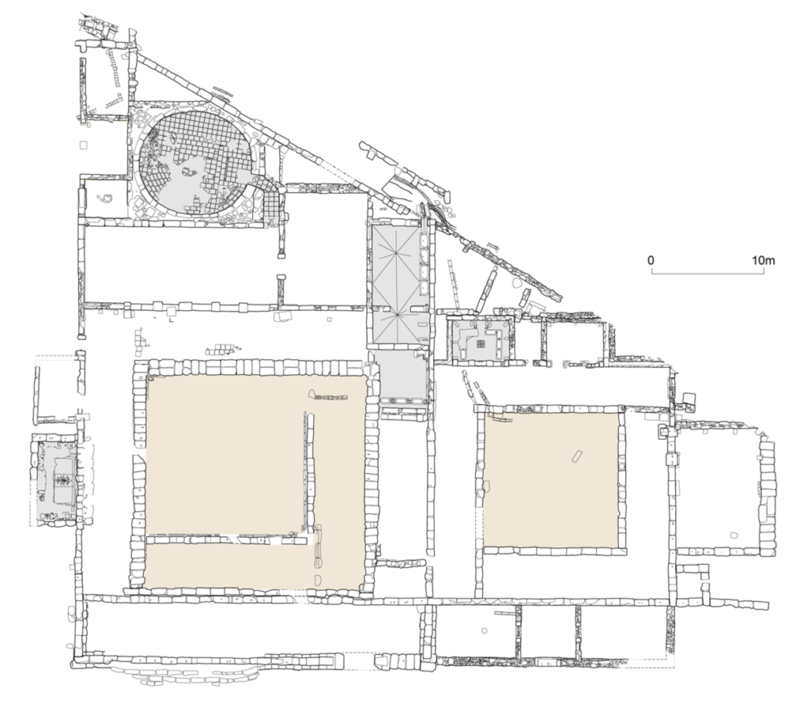 The restoration of the building in 2013–2014 by the Greek Archaeological Service (with European funding) led to the completely unexpected discovery of a second complex, with an identical floor plan, adjoining the gymnasium. From 2015 to 2017, the ESAG explored the newly discovered building in order to clarifiy the function of the spaces and the chronology of it construction and abandonment. 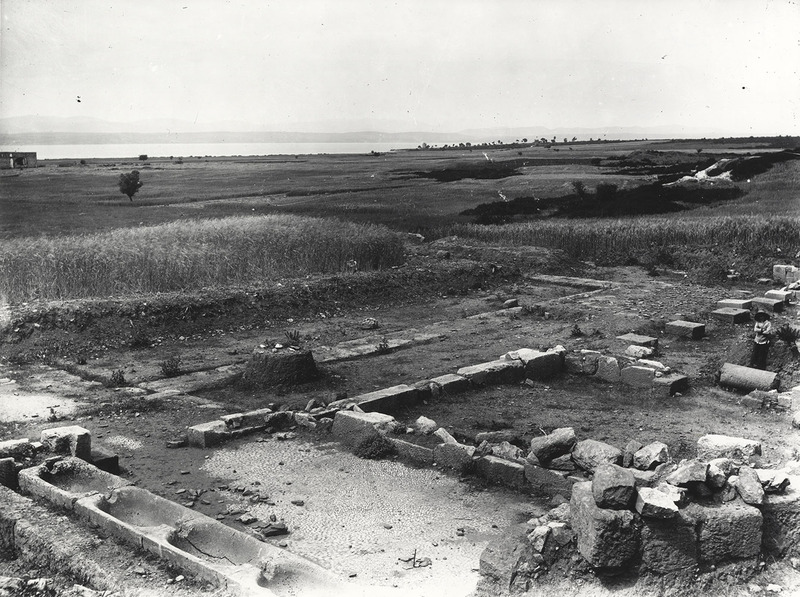 A third palaestra uncovered near the harbour in the early 20th century will be investigated in 2018 for a comprehensive understanding of the institution of the gymnasium in Eretria. 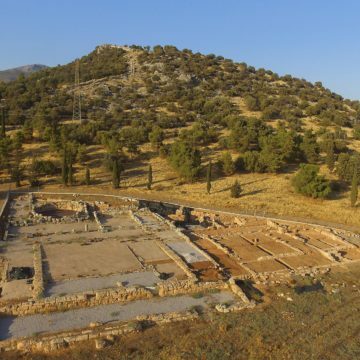 A three-year excavation program in the Gymnasium of Eretria was carried out between 2015 and 2017 under the direction of Guy Ackermann (University of Lausanne), Rocco Tettamanti (Archaeological Service, Fribourg) and Karl Reber, director of ESAG. The primary goal was to extend the excavation in the newly discovered eastern part of the building and to open trial trenches to collect evidence for the construction date of the whole monument. 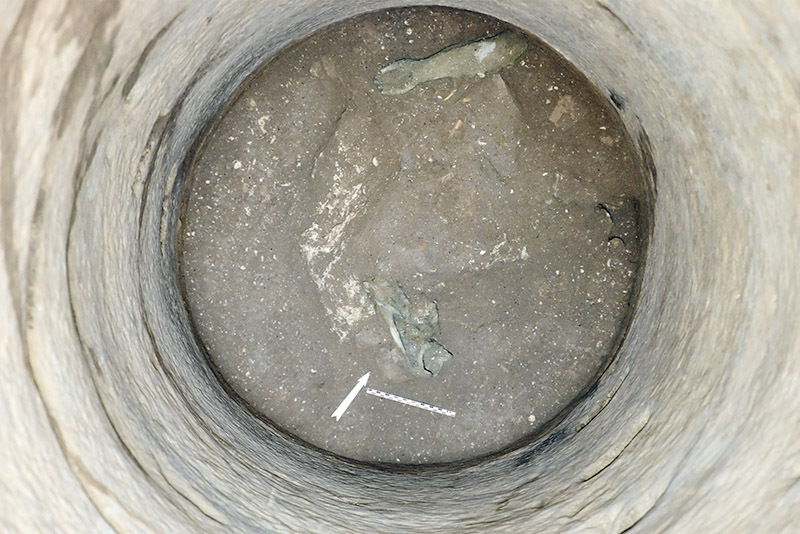 Although the stratigraphy appeared to be significantly eroded and archaeological features were partially perturbated by previous explorations of the building, diagnostic finds allowed to refine the chronology of the monument. 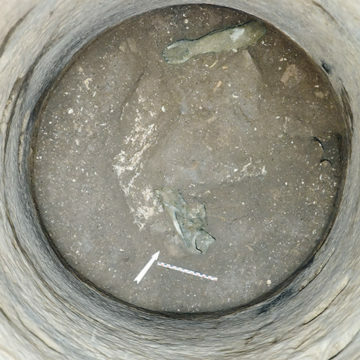 The excavation of a 13,45m deep well yielded a rich assemblage of animal and human bones together with exceptional finds, such as the two forearms belonging to the near life-size statue of a young man or a gilt bronze figurine of the Ephesian Artemis. Three fragments of two arms belonging to a marble statue larger than life-size were also discovered in a series of rooms south of the eastern courtyard. 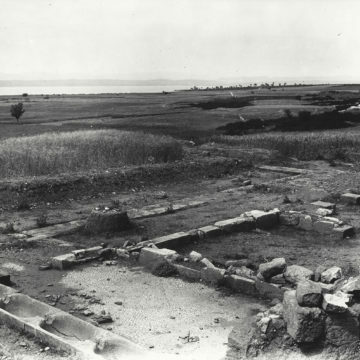 The Gymnasium of Eretria is located on the first slope of the acropolis. It is one of the rare occurrence of a double-courtyard gymnasium. The western courtyard and related spaces were built around 330–320 BC and they remained in use until the end of the 1st c. AD if not later. The eastern part was more shortliving: it was built at the beginning of the 3rd c. BC and seems to have been abandoned in the 1st c. BC. 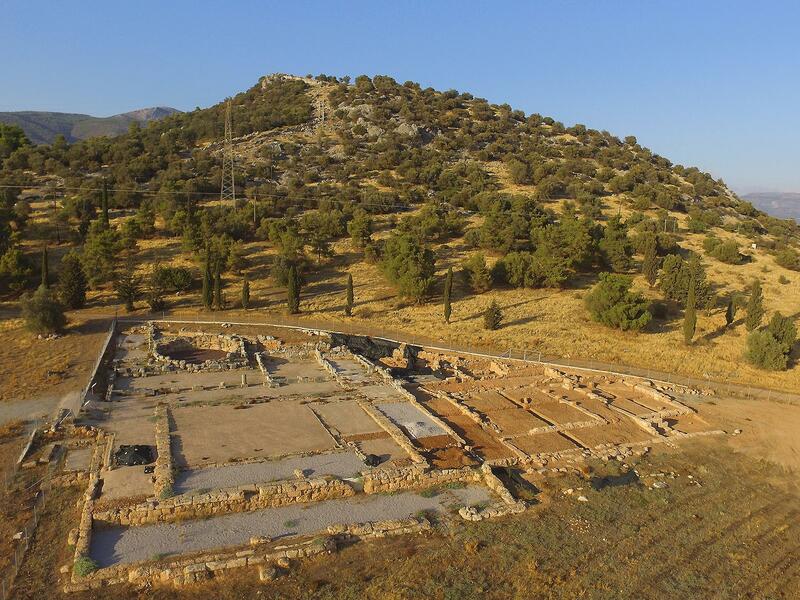 The construction of the Gymnasium is likely to be related with the adoption by the Eretrians of the Athenian institution of the ephebeia around 319/8 BC or soon after. The reason for the double-courtyard plan of the edifice is probably related to their use by two distinct age groups. This hypothesis has been substantiated by the discovery in 2017 of an inscription mentioning neoteroi. The Gymnasium featured an early Hellenistic loutron with a series of seven interconnected stone basins supplied by a freshwater canalisation for shower bath. Athletes used to wash their bodies by sprinkling cold water drawn from these basins. During the Late Hellenistic period, an adjoining space to the south completed the facilities with three stone basins embedded in the floor for foot baths. At the same time, two exedrae opening on the gallery of the courtyard were added to offer bathing facilities. They both share the same plan and equipment: a mosaic floor and a bench along three sides, interrupted in the axis of the rear wall by a freestanding structure, probably a basin. The water flowed from it into a series of stone basins embedded in the floor in front of the bench. The layout of these two bathing exedrae is reminiscent of the loutron and they were probably used for shower and foot baths with cold water. They find no close parallel in Greek architecture. No evidence of heating facilities have been observed in these bathing spaces, yet the gymnasium also provided a steam room. It consisted of a vast near-circular room of some 10 meters in diameter with a floor made of terracotta tiles and probably covered by a dome-shaped roof. There is no hypocaust system but traces of burning at the centre have been interpreted as evidence for a heating system. The absence of any water supply or drainage system indicates that this space was a dry steam room or pyriaterion, related to a kind of therapeutic bathing.